We are Team 17, a Year 6 class at Bailey Road School in Mt Wellington, Auckland, New Zealand. Our teacher is Mr. Wood and we want to share our learning with our whānau (family) and other learners. We hope you will enjoy our blog and leave us comments. Our Garden Club harvested all our vegetables and herbs, then our member helped sort and bundle the vegetables and herbs. We were amazed by how much our garden produced. Our sale was very successful and we raised $150.00 for the 2011 school garden club. Pearl- Being in the garden club was really fun because we get free vegetables and I love getting my hands dirty. Shradha - I really enjoyed being in the garden club because we got free vegetables. Catherine-I love to be in the Garden Club because we get a bit dirty and harvest the food. Sharnika - Being in the garden club was a lot of fun because we grew lots of vegetables and had our biggest harvest which we made over $100. Team 17 wish you a merry Christmas and have a fun, safe holiday. You Aha and D'oh Moments? What were you Aha and D'oh moment of 2010? Team 17's blog is famous once again. Top 100 classroom blogs is a website for teachers and students to find good examples of classroom blogs. We are proud that we can share our learning with other classes and to be one of the Top 100. 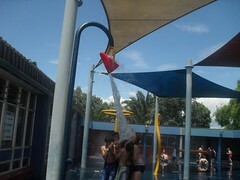 On the 9 of December our class went to Swim-a-rama (swimming.) 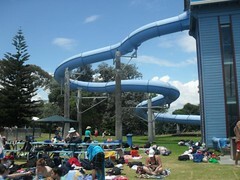 It had the Hydro Slide, Commando course,diving and normal swimming pools plus a playground. 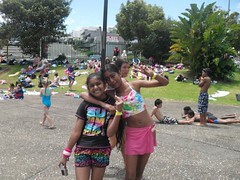 We had a lot of fun and we wish we could stay there forever. Hydro slide (Note: It's dark inside). Henrica & Bernie on the Commando (Note: Green thing is hard to get on and is slippery.). That's it for Thursday and we enjoyed it!!!!!!!! In kayaking we learnt how to paddle a kayak with paddles. It was easy but Kiu's left shoulder got sore. Some people fell out a lot: Steven-5; Kiu-5; Isaiah-4; A.J-1; Nick-9 times. During kayaking we learnt how to change direction using the paddle and we played games. My most fun moment was trying to climb over people to swap kayaks. 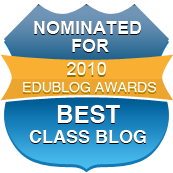 Congratulations Team 17, we have been nominated for a 2010 Edublogs Award for Best Class Blog! You should be proud of yourselves as every one of you have contributed, commented and created, and you made our class blog what it is. Thank you to all our readers and co-learners out there, you nominated us and we are honoured to be finalist in this award. We will continue to try make you proud. Please vote for us here, and spread the word. On the first day of summer The Garden Club harvested their fresh meadow green silver beet. Mr.Wood took them to the teacher's staff room so we could sell them to teachers and raise money, so the next time we grow our garden we could afford to buy seeds to keep on the fantastic progress. They have been growing for 7 weeks and we have decided to harvest them. So that the next time they are fully grown (in week ten) we will harvest it again and hopefully it would be a lot bigger. I would just like to thank all the Garden Club members for making sure the garden is always watered and healthy as it is their responsibility. Click here to vote for us. Bullying No Way…A National Day of Action against Bullying and Violence. Want your own personal blog? Have you seen our beans? 1. I am here to learn!